A sea-god carries a nymph or sea-goddess across the sea. 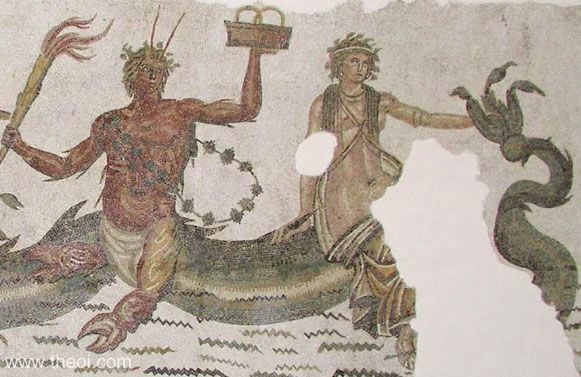 The marine deity is probably Phorcys and the woman either his wife Ceto or a Nereid-nymph. He is depicted as a red-skinned merman with the coiling tail of a serpentine fish, lobster-claw "feet" and lobster horns. His arms and torso are adorned with sharp crustacean spines. The god holds a box (of salt?) in one hand and a flaming torch in the other, and is draped in a wreath of seaweed(? ).